Posted by Gerald Lombardo on Wednesday, December 19th, 2018 at 12:35pm. Hog Hammock Trail in West Palm Beach is a new trail composed of crushed concrete and with intermittent boardwalks. The area is a combination of restored and natural wetland communities including cabbage palm hammocks, mesic pine flatwoods, forested wetlands and cypress domes. Restrooms and water are available at the parking lot. The trail is perfect for a leisurely hike, especially while it’s nice and cool outside, or as a way to get some fresh air and spend part of your weekend outdoors. After walking or jogging the Hammock Trail you may want to head over to the Cypress Boardwalk which is about one mile away. 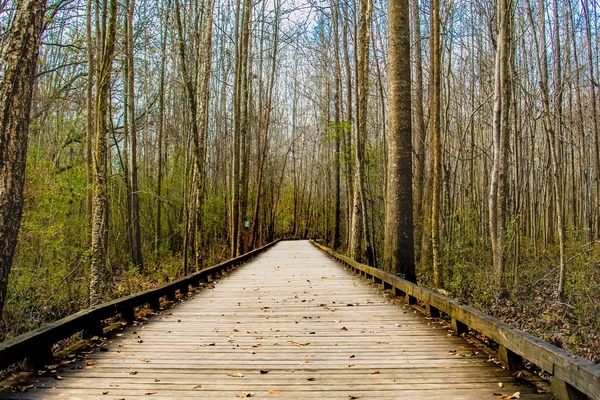 Cypress is a mile-long boardwalk extending through marsh and cypress swamp. The boardwalk has lots of opportunities for viewing Florida’s flora and fauna. You can also stop by the Nature Center to speak with a naturalist or sign up for a guided program. The wildlife you can plan on seeing includes snail kites are a common sight and bald eagles nest here in winter. Look for alligators, pig frogs, apple snails, great blue herons, and anhingas. Location: Parking at 8537 Northlake Blvd located 4.5 miles west of I-95 on the north side of Northlake Boulevard.